This Taperwing was brought to us by the owner as a basic skeleton without wings or tail pieces…essentially just a fuselage skeleton. The fuselage was inspected and found to be basically acceptable for restoration. Therefore, nearly all of the airplane as shown has been built new…wings and center section, struts, landing gear, oleos, tail surfaces. 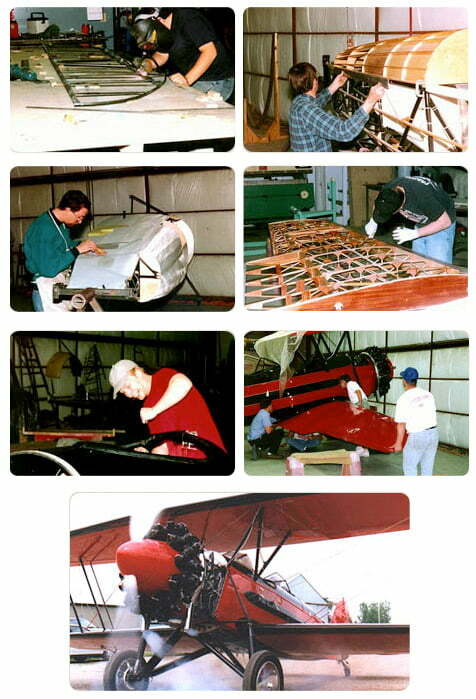 In short, the aircraft has been transformed into a near new aircraft within the FAA repair regulations. The aircraft was assembled and finished in a style that was designed by its owner, who wanted it to appear as a race or airshow pilot would have painted it in the 1930s. At that time the Taperwing was the airshow plane of choice, and he wanted it to reflect what an airshow pilot might have desired for his mount…even to “Taperwing” emblazoned across the top wing. Waco often crafted custom racing style windshields and front cockpit covers, which was applied to this restoration, and the front windshield is also removable. This gives the airplane a quite rakish look, and, when the owner wishes to fly solo, the rear cockpit is much more comfortable account the lack of turbulence and the speed is enhanced. The engine is the Wright R970-11 developing 450 hp. This is an updated version of the engines that were originally used on the type. RARE Aircraft also installed a Bendix fuel injection system which is, of course, a later iteration…one of only two known to be in current operation.This produces a very smooth operation throughout the aerobatic range, not to mention ease of starting and rapid acceleration. Original 4″ instruments are fitted, and a complete set of operating instruments is installed below the original panel along with modern GPS navigation system and COM radio. It also has a full intercom so the pilot can communicate with his passengers. Both cockpits are upholstered in full leather interiors. The aircraft carries 90 gallons of fuel. Given its spectacular speed this results in an amazing range for cross country. It has been flown from Minnesota to New Orleans in less than a day with two fuel stops, New Orleans to Florida with one fuel stop, Florida to Maryland with two fuel stops. This airplane was flown by airshow great Len Povey in the mid 30s. He later flew with the Cuban Air Force and is credited with inventing the “Cuban Eight” maneuver. It was later owned and flown by another famous airshow pilot, Bevo Howard. The aircraft is presently based in Wyoming and regularly flown by its owner.